You sign up as a volunteer through your local county Cooperative Extension office. The 4-H Representative in the Extension office can help you find clubs near you and start you on the process of becoming a volunteer. *For Spanish: The 4hOnline system is only in English. Please fill in the paper enrollment packet in Spanish (PDF) and turn it in to your club leader or county staff for them to enter it into 4hOnline for you. Please keep a copy of the paper forms for your records. Complete a Live Scan background check with the California Department of Justice. After you complete and submit your 4hOnline profile, check the Family email you used in 4hOnline for eXtension login instructions. If you used a paper enrollment form, you will have to check with your county 4-H Representative for the instructions. 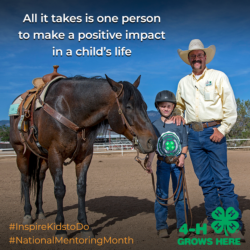 Your county may have additional resources specific to your county, so please connect with your county 4-H Program Representative.